Challenges are what make life interesting and overcoming them is what makes life meaningful. To overcome any challenge you need to be well equipped with the right tools and utensils, and the first place to start is your wardrobe. 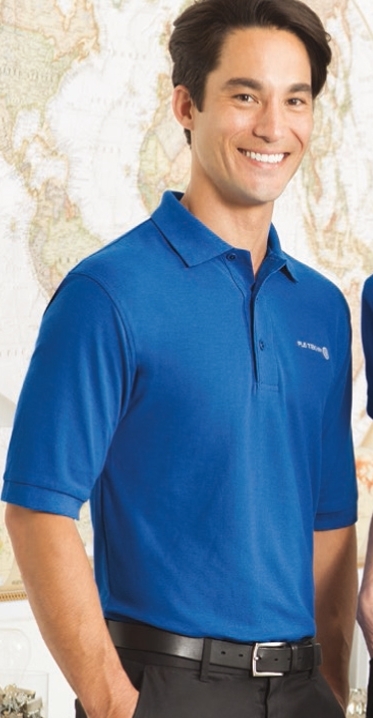 The forever popular and treasured Port Authority’s Silk Touch™ Polo, is once again a prized item owned by our customers this year. The Polo is a timeless classic, which is a reoccurring item in summer and winter trends every year. This classic look can be worn actively or leisurely. It is perfect for team or group events, whether it be a schools active wear, a business’ team bonding outing or at a sales show. You have a team of employees or volunteers, and need them dressed in a simple yet effective design? Why not have them wear Port Authority’s Silk Touch Polo shirt. It is also favoured by many sports teams, especially tennis and golf teams as these items of clothing are both smart looking and comfortable. So what makes it so comfortable? The superior wrinkle and shrink resistance and a silky soft hand all play a part to make this top a dream uniform for any occasion. The classic Polo comes in an immense colour range; Banana, Bark, Black, Bright Lavender, Burgundy, Clover Green, Coffee Bean, Cool Grey, Court Green, Dark Green, Deep Berry, Eggplant, Gold, Hibiscus, Kelly Green, Light Blue, Light Pink, Light Stone, Lime, Maroon, Maui blue, Mediterranean Blue, Mint Green, Navy, Orange, Purple, Red, Royal, Steel Grey, Stone, Strong Blue, Teal Green, Texas Orange, Tropical Pink, Ultramarine Blue and White. This colour range covers every colour group, which leaves the essential Polo perfect for any organisation, whatever your unique bran colour may be. Each top is 65/35 poly/cotton pique which makes for maximum comfort in any temperature. The uber stylish flat knit collar and cuffs are topped off with Metal buttons with dyed-to-match the plastic rims. Double-needle armhole seams and hem and side vents create an aero-dynamic t-shirt which acclimatises your body to your surroundings and current climate. The extended sizes on this top go from 7XL, 8XL, 9XL and 10XL. This doesn’t mean this stylish shirt loses its shape or appeal. Every Port Authority top from XS to 10XL is made with the same material and care. When overcoming challenges and breaking down barriers make sure this Silk Touch Polo is on your side.